The term ‘post-rock’ means many things to many people, but the origin of the term in it’s modern form is generally attributed to Wire critic Simon Reynolds for his description of “using rock instrumentation for non-rock purposes”. Nearly a decade and a half after, it’s fair to say that this description no longer fits the bill. ‘Post-rock’ is now as much a genre as ‘soul’, ‘blues’ or ‘ska-punk’. What makes a ‘post-rock’ band then? Reverb laden guitars picking out simple arpeggiated melodies? Indeed. Quiet passages that give way to distorted variations on the previously established theme? Yes please. Vocals being entirely absent, or present only as another instrument? You bet. Portentous (or should that be pretentious) song titles? We’ll have some of that thank you very much. What once stood for innovation now represents an easy to follow Ikea-style home-build blueprint, whereby following the instructions and slotting the pieces together correctly is almost a guarantee of success; which brings us to Movus. 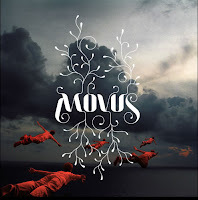 On their self-titled debut album, Movus present 10 songs of tight, professionally played, well constructed ‘post-rock’; the problem is that this is all they bring, and in an ever swelling, burgeoning scene these factors are no longer enough to separate a band from their peers. While there are certainly no songs that are anything less than professionally played and solidly constructed across the album, there is also nothing that would stand out from the crowd if you plugged, for example, the name Mono into Last.fm and listened to the endless stream of bands that followed. Such is the dearth of fresh ideas on display that during "Moho" Movus directly thieve a melody from a song that is generally considered to be one of the best that the instrumental scene has thrown up in recent years; Mogwai’s "Hunted By A Freak." While it only lasts for a brief minute or so out of the album’s whole length, it speaks volumes for the band’s approach, and simultaneously serves to show the difference in quality between proponents of the flat-pack assembly approach and the work of genuine master craftsmen.